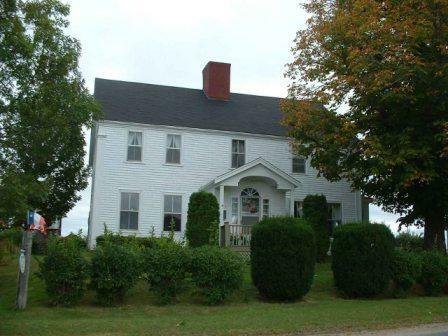 In 1800 John Sangster, believed to have come a decade earlier from Scotland, purchased a number of farm lots overlooking the ferry crossing for the road from the Windsor side through to Horton. Later in the same year Sangster received a license to keep a "House of Entertainment for the accommodation of travelers". Whether this house was on the site before Sangster purchased his lots or he had it build is unknown, but the reference is certainly to what became known as Sangster Inn. The Sangster Inn is a large two and one half storey, wood frame building with a gable roof and large central fireplace. The front elevation is five bays wide with a central entrance, which in turn incorporates an entrance porch, sidelights and fanlight. Besides the entrance the main exterior decorative element is the corner board detailing, with finely moulded capitals. The original windows have been replaced, though the actual window openings remain unaltered. Evident exterior features support a late 18th century date of construction.